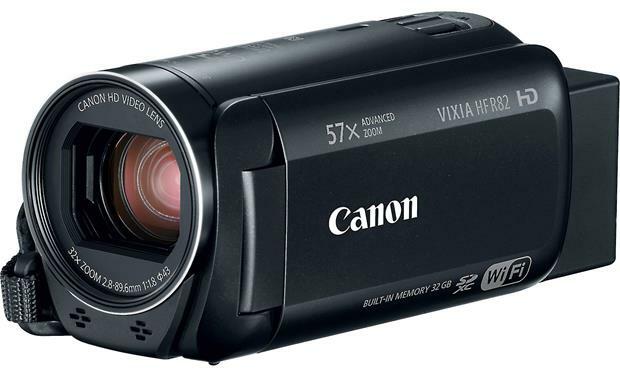 Sometimes friends and family just can't be there for life's milestones, and that's where the Canon VIXIA HF R82 comes in. Built-in Wi-Fi lets you capture those "you-had-to-be-there" moments, then upload and share them instantly. If you have a compatible Android™ device, you can use the R82's NFC (Near Field Communication) for quick and easy touch-pairing. Wirelessly upload video clips or photos to social media, stream live video to your phone or tablet, or send files to your computer for a quick edit before posting online. The R82's Wi-Fi connection also allows you to use your mobile device as a remote control. Set the camera up on a tripod in the ideal spot, then go back to your seat to enjoy the show via live streaming. Just download Canon's CameraAccess Plus app and your compatible mobile device becomes a highly functional remote control center. The R82 has plenty of other features that make it easier to get great shots and save them for posterity. Framing Assistance helps keep distant subjects centered, even when they're in motion, and Backlight Correction keeps your subject from washing out. The camera's seven built-in adjustable filters include Old Movie, Cool, Dramatic Black & White, Vivid and more. Get creative and record slow-motion images at speed settings down to 0.5x, or go the other direction — fast motion can record at up to 1200x, though you may find that the 300x and 600x options are more your, ahem, speed. 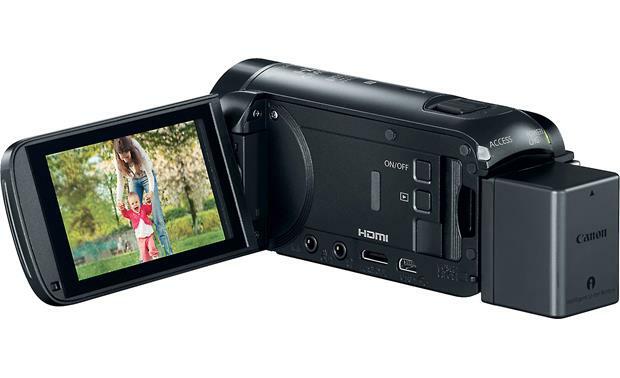 3.0" Widescreen LCD Capacitive Touch Screen: The Canon VIXIA HF R82 features a 3.0" Capacitive Touch Panel LCD screen (230,000 dots) to make it easy to compose and review your shots. The capacitive touch technology is similar to that of a smartphone, and lets you activate functions by a simple touch. The LCD screen can be rotated 270° allowing the subject to monitor the LCD screen during shooting. The LCD's touch screen contains zoom, playback and menu controls for added convenience. 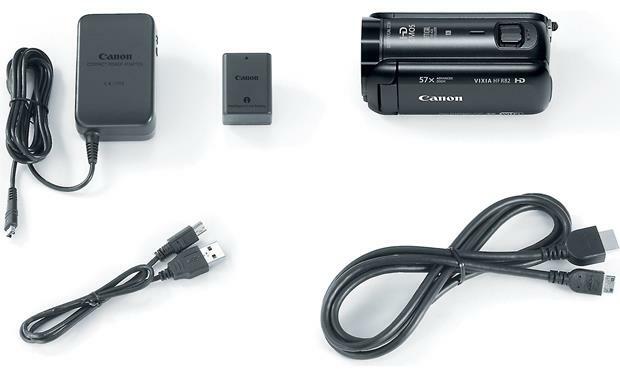 Recording Media: The Canon HF R82 camcorder captures video and still-images onto its built-in 32 GB internal memory, or optional SD, SDHC, or SDXC memory cards (sold separately) with a Speed Class rating of 4 and up. Class 6 or 10 SD cards are recommended for recording movies with a video quality of 60p or 35Mbps. There are no memory cards included with the camcorder. Image Sensor: The HF R82 features a 1/4.85" CMOS image sensor with approximately 3,280,000 total pixels for excellent detail and clarity when recording video and exceptional digital still photography performance. The effective pixel count is approximately 2,070,000 for movies and still images. 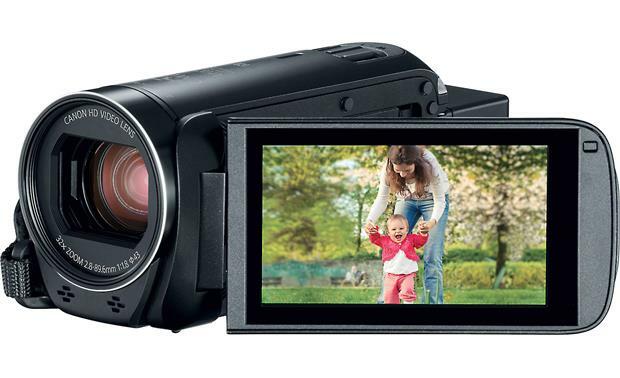 DIGIC DV 4: The HF R82 is equipped with the DIGIC DV 4 HD image processor. It captures more light than its predecessor DV III, for brighter, cleaner images. It also features increased processing power for better image stabilization, even when walking. Built-in Wi-Fi: The HF R82 is equipped with built-in Wi-Fi (IEEE 802.11 b/g/n, 2.4 GHz) for wirelessly sharing your movies and images with your friends and family. You can upload images and video to various Social Networking sites through the Canon Image Gateway online photo album, or send them to a PC (connected via an access point) for storage. With the free CameraAccess plus App, you can enjoy live streaming and remote operation on an iOS or Android device. Most of the Wi-Fi features are compatible with devices running iOS 8 and up, and Android devices running version 4.0 and up. The Canon CS100 Connect Station and NFC-enabled Android devices can automatically connect to the camcorder by touching the NFC touch points together. Genuine Canon Video Lens: The HF R82 comes with a Genuine Canon HD video lens with a 32x Optical zoom. The 57x Advanced zoom makes more efficient use of the effective imaging area to take the telephoto power all the way to 1853mm (35mm equivalent). HDMI Output: The HF R82 features a mini-HDMI (Type C) terminal that offers a high-quality digital connection that combines audio and video in a single convenient cable. The HDMI port is compatible with HDMI-CEC (Consumer Electronics Control), allowing you in many cases to control the camcorder with the remote control of the connected TV. Microphone Input: In addition to the camcorder's built-in microphone, the HF R82 features a 3.5mm microphone input for connecting an external microphone. 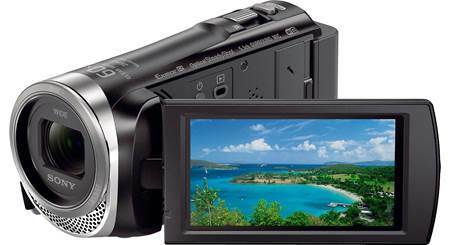 Downloadable Software: The Canon HF R82 camcorder comes with no software in the box. CameraWindow DC software is available for download from the Canon website (URL provided in the Operating Manual). CameraWindow DC is used for saving MP4 movies and photos to your computer and organize them. It is compatible with Windows 10 (desktop mode), 8.1 and 7 SP1, and Mac OS X v10.9 to v10.12. 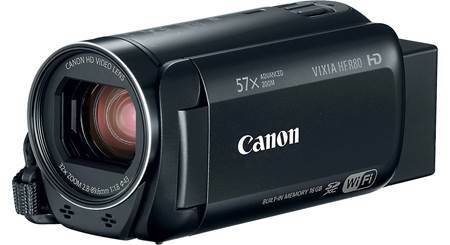 I have a Canon HF R82 camcorder but think I need an external mic. One salesman tells me to get a Rode VideoMicro, which does not require batteries. I cannot find in the specs for the R82 if the microphone jack is powered. Is it powered and can I use a 20ft male/male cable with it? If not a VideoMicro, what external microphone would you suggest? Searches related to the Canon VIXIA HF R82 HD camcorder with 32X optical zoom, 32GB internal flash drive, and Wi-Fi®.